Une nonne occidentale qui pratique le bouddhisme tibétain prend soudain conscience que tous les maîtres qu’elle a rencontré sont des hommes. Elle réalise l’importance pour les pratiquantes de découvrir la biographie de grandes yoginis, c’est ce qu’elle va s’employer à rechercher et qu’elle nous offre. Parmi ces biographies figure celle qui prendra une importance toute particulière pour elle, celle de Machik Labdron. 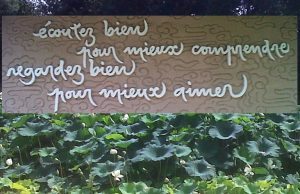 En effet, elle éprouvera une très forte attirance pour la pratique du Chod, enseignée par la grande yogini. Tsultrim Allione fondera un centre de pratique et sera reconnue par la suite dans les milieux tibétains comme une « émanation » de Machik Labdron. There is a hunger among women practitioners for the stories of other women who have gone on before them. Often these stories have been lost or over time turned to silence. Tsultrim Allione, founder of Tara Mandala, a 600 acree retreat center in South West Colorado, sets out with this book to reclaim some of those lost voices. She was initiated on this journey with the death of her daughter from Sudden Infant Death Syndrome. Prior to becoming a mother to four children, Tsultrim had been one of the first American women to take vows. For four years she lived in the Himalayas as a nun devoted to in depth practice. Later she returned her vows and became a mother and with the death of one of her twins began the search for stories to sustain her during unbearable times. 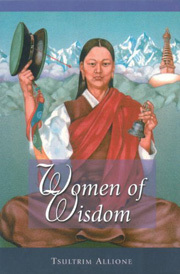 In Women of Wisdom she uncovers and chronicles the stories of several of the more well-known women practioners, saints, and delogues, but what is particularly compelling is her own story. She writes openly and honesty with remarkable ease. 2) This is a lovely collection of sacred biographies of Tibetan Buddhist yoginis. The author, a former Buddhist nun, provides an extensive introduction including an autobiographical account-virtually a 7th biography. She provides much valuable information about the Buddha families, biography vs. sacred biography or hagiography, and Tibetan traditions and terminology such as delogs (people who die and come back to life), Togdens (Tibetan yogis), etc. The six sacred biographies included here vary considerably in length (2 are quite long and 4 are rather short) and in nature (some include much more hyperbole and others are more historical). The author states on p. 54 that « Goodness is not necessarily truth. » She also provides a prolog and extremely valuable endnotes for each chapter, suggesting that (p. 215) the reason for embedding teachings into a biography is to make them come to life.